Man Charged After Attack On Painting At London's National Gallery : The Two-Way A man entered The National Gallery in London on Saturday afternoon, approached a painting by British master Thomas Gainsborough and proceeded to attack it with a "sharp object," the museum says. 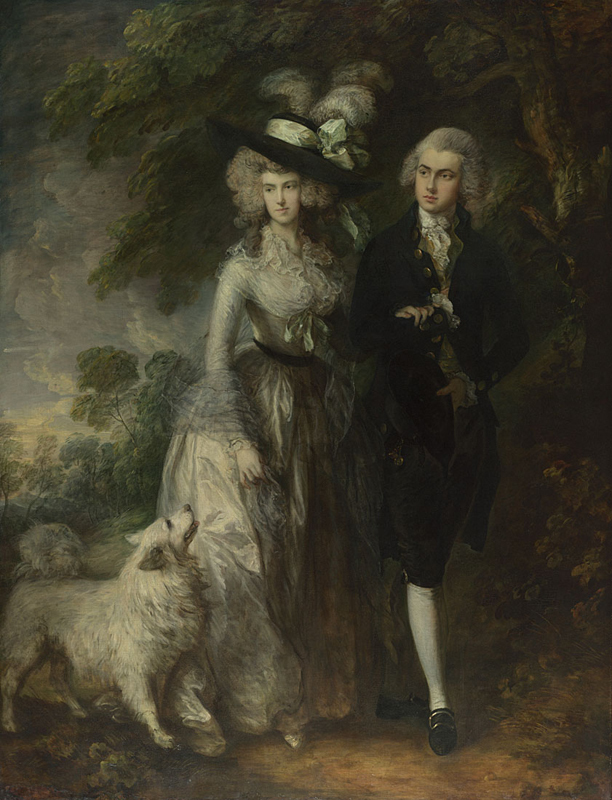 Thomas Gainsborough's 1785 painting Mr and Mrs William Hallett (The Morning Walk) was attacked at The National Gallery in London on Saturday. A man entered the National Gallery in London on Saturday afternoon, approached a painting by British master Thomas Gainsborough, and proceeded to attack it with a "sharp object." A Metropolitan Police Service spokesman tells NPR that a 63-year-old man named Keith Gregory, "of no fixed abode," was charged with causing criminal damage to a National Gallery painting. It's not clear what motivated the attack on Gainsborough's 1785 work Mr and Mrs William Hallett, more commonly known as The Morning Walk. The museum said in a statement that the suspect was quickly apprehended by museum staff and visitors, and then arrested by the police. "The damage is limited to two long scratches which have penetrated the paint layers, but not the supporting canvas," the museum said. "The painting was removed from display and examined by the Gallery's conservators, who are now assessing next steps." The National Gallery did not specify what type of "sharp object" was used to attack the work of art, though one Reddit user said bystanders were speaking about a screwdriver. Gregory "appeared in custody at Westminster Magistrates' Court on Monday, 20 March and was remanded to next appear on Thursday, 23 March," the police said. Mark Bills, the director of the museum Gainsborough's House, described the incident as "quite shocking" in an interview with The Guardian. "It's a picture that I can't imagine anybody finding offensive," Bills said. "What an odd thing to want to do." The gallery's East Wing was closed immediately after the incident and reopened within two hours. The painting was housed in a room of British art from 1750-1850, including paintings by John Constable and J.M.W. Turner. In the James Bond film Skyfall, the room "was used as the setting for a covert meeting between Daniel Craig's James Bond and Ben Whishaw's equipment expert Q," the Guardian added. The painting itself depicts a young couple on a walk with a white, fluffy dog. "William Hallett and Elizabeth Stephen were both aged 21 and due to be married in the summer of 1785, shortly after the painting was completed," according to the museum's description. Bills tells the Guardian that the painting is one of Gainsborough's "great masterpieces." He adds: "When we think about Gainsborough, it's usually from around these years. When you think of the elegant portraits of the Georgian period, that's the one that comes to mind."